The most transformative conflict in history, World War II impacted the entire globe and set the stage for the Cold War. As the war raged, the leaders of the Allies met several times to direct the course of the fighting and to begin planning for the postwar world. With the defeat of Germany and Japan, their plans were put into action. Planning for the post-World War II world began before the United States even entered the conflict. On August 9, 1941, President Franklin D. Roosevelt and Prime Minister Winston Churchill first met aboard the cruiser USS Augusta. The meeting took place while the ship was anchored at US Naval Station Argentia (Newfoundland), which had recently been acquired from Britain as part of the Bases for Destroyers Agreement. Meeting over two days, the leaders produced the Atlantic Charter, which called for self-determination of peoples, freedom of the seas, global economic cooperation, disarmament of aggressor nations, reduced trade barriers, and freedom from want and fear. In addition, the United States and Britain stated that they sought no territorial gains from the conflict and called for the defeat of Germany. Announced on August 14, it was soon adopted by the other Allied nations as well as the Soviet Union. The charter was met with suspicion by the Axis powers, who interpreted it as a budding alliance against them. Shortly after the US entrance into the war, the two leaders met again in Washington DC. Codenamed the Arcadia Conference, Roosevelt and Churchill held meetings between December 22, 1941, and January 14, 1942. The key decision from this conference was agreement on a "Europe First" strategy for winning the war. Due to the proximity of many of the Allied nations to Germany, it was felt that the Nazis offered a greater threat. While the majority of resources would be devoted to Europe, the Allies planned on fighting a holding battle with Japan. This decision met with some resistance in the United States as public sentiment favored exacting revenge on the Japanese for the attack on Pearl Harbor. The Arcadia Conference also produced the Declaration by the United Nations. Devised by Roosevelt, the term "United Nations" became the official name for the Allies. Initially signed by 26 nations, the declaration called for the signatories to uphold the Atlantic Charter, employ all their resources against the Axis, and forbade nations from signing a separate peace with Germany or Japan. The tenets set forth in the declaration became the basis for the modern United Nations, which was created after the war. While Churchill and Roosevelt met again in Washington in June 1942 to discuss strategy, it was their January 1943 conference in Casablanca that would affect the war's prosecution. Meeting with Charles de Gaulle and Henri Giraud, Roosevelt and Churchill recognized the two men as the joint leaders of the Free French. At the end of the conference, the Casablanca Declaration was announced, which called for the unconditional surrender of the Axis powers as well as aid for the Soviets and the invasion of Italy. That summer, Churchill again crossed the Atlantic to confer with Roosevelt. Convening in Quebec, the two set the date of D-Day for May 1944 and drafted the secret Quebec Agreement. This called for a sharing of atomic research and outlined the basis of nuclear nonproliferation between their two nations. In November 1943, Roosevelt and Churchill traveled to Cairo to meet with Chinese leader Chiang Kai-Shek. The first conference to primarily focus on the Pacific war, the meeting resulted in the Allies promising to seek the unconditional surrender of Japan, the return of Japanese-occupied Chinese lands, and Korean independence. On November 28, 1943, the two western leaders traveled to Tehran, Iran to meet with Joseph Stalin. 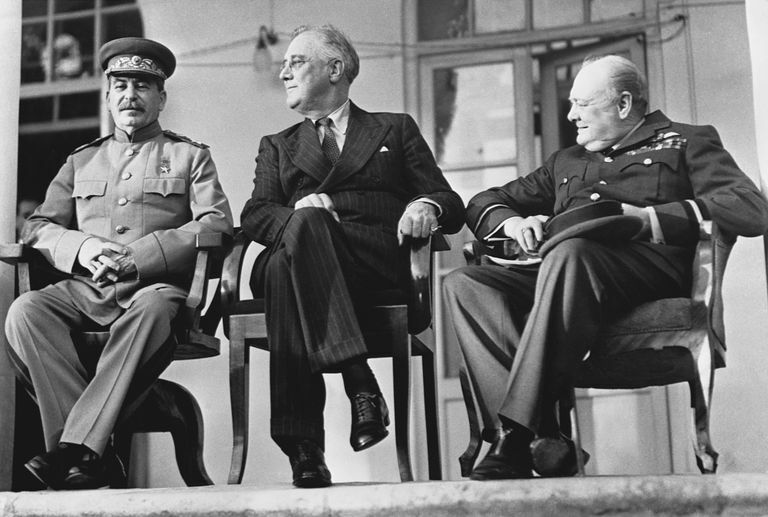 The first meeting of the "Big Three" (United States, Britain, and the Soviet Union), the Tehran Conference was one of only two wartime meetings between the three leaders. Initial conversations saw Roosevelt and Churchill receive Soviet support for their war policies in exchange for backing the communist Partisans in Yugoslavia and allowing Stalin to manipulate the Soviet-Polish border. Subsequent discussions centered on the opening of a second front in Western Europe. The meeting confirmed that this attack would come through France rather than through the Mediterranean as Churchill desired. Stalin also promised to declare war on Japan following the defeat of Germany. Before the conference concluded, the Big Three reaffirmed their demand for unconditional surrender and laid out the initial plans for occupying Axis territory after the war. While the Big Three leaders were directing the war, other efforts were moving forward to build the framework for the postwar world. In July 1944, representatives of 45 Allied nations gathered at the Mount Washington Hotel in Bretton Woods, NH to design the postwar international monetary system. Officially dubbed the United Nations Monetary and Financial Conference, the meeting produced the agreements that formed the International Bank for Reconstruction and Development, the General Agreement on Tariffs and Trade, and the International Monetary Fund. In addition, the meeting created the Bretton Woods system of exchange rate management which was used until 1971. The following month, delegates met at Dumbarton Oaks in Washington, DC to begin formulating the United Nations. Key discussions included the make-up of the organization as well as the design of the Security Council. The agreements from Dumbarton Oaks were reviewed April-June 1945, at the United Nations Conference on International Organization. This meeting produced the United Nations Charter which gave birth to the modern United Nations. As the war was winding down, the Big Three met again at the Black Sea resort of Yalta from February 4-11, 1945. Each arrived at the conference with their own agenda, with Roosevelt seeking Soviet aid against Japan, Churchill demanding free elections in Eastern Europe, and Stalin desiring to create a Soviet sphere of influence. Also to be discussed were plans for the occupation of Germany. Roosevelt was able to obtain Stalin's promise to enter the war with Japan within 90 days of Germany's defeat in exchange for Mongolian independence, the Kurile Islands, and part of Sakhalin Island. On the issue of Poland, Stalin demanded that the Soviet Union receive territory from their neighbor in order to create a defensive buffer zone. This was reluctantly agreed to, with Poland being compensated by moving its western border into Germany and receiving part of East Prussia. In addition, Stalin promised free elections after the war; however, this was not fulfilled. As the meeting concluded, a final plan for the occupation of Germany was agreed upon and Roosevelt obtained Stalin's word that the Soviet Union would participate in the new United Nations. The final meeting of the Big Three took place at Potsdam, Germany between July 17 and August 2, 1945. Representing the United States was new president Harry S. Truman, who had succeeded to the office following Roosevelt's death in April. Britain was initially represented by Churchill, however, he was replaced by new Prime Minister Clement Attlee following Labor's victory in the 1945 general election. As before, Stalin represented the Soviet Union. The principal goals of the conference were to begin designing the postwar world, negotiating treaties, and dealing with other issues raised by the defeat of Germany. The conference largely ratified many of the decisions agreed to at Yalta and stated that the goals of the occupation of Germany would be demilitarization, denazification, democratization, and decartelization. In regards to Poland, the conference confirmed the territorial changes and gave recognition to the Soviet-backed provisional government. These decisions were made public in the Potsdam Agreement, which stipulated that all other issues would be dealt with in the final peace treaty (this was not signed until 1990). On July 26, while the conference was ongoing, Truman, Churchill, and Chiang Kai-Shek issued the Potsdam Declaration which outlined the terms for Japan's surrender. With the end to the war, the Allied powers began occupations of both Japan and Germany. In the Far East, US troops took possession of Japan and were aided by British Commonwealth forces in the reconstruction and demilitarization of the country. In Southeast Asia, the colonial powers returned to their former possessions, while Korea was divided at the 38th Parallel, with the Soviets in the north and the US in the south. Commanding the occupation of Japan was General Douglas MacArthur. A gifted administrator, MacArthur oversaw the nation's transition to a constitutional monarchy and the rebuilding of the Japanese economy. With the outbreak of the Korean War in 1950, MacArthur's attention was diverted to the new conflict and increasingly more power was returned to the Japanese government. The occupation ended following the signing of the San Francisco Peace Treaty (Treaty of Peace with Japan) on September 8, 1951, which officially concluded World War II in the Pacific. In Europe, both Germany and Austria were divided into four occupation zones under American, British, French, and Soviet control. Also, the capital at Berlin was divided along similar lines. While the original occupation plan called for Germany to be ruled as a single unit through the Allied Control Council, this soon broke down as tensions rose between the Soviets and the Western Allies. As the occupation progressed the US, British, and French zones were merged into one uniformly governed area. On June 24, 1948, the Soviets initiated the first action of the Cold War by shutting down all access to Western-occupied West Berlin. To combat the "Berlin Blockade," the Western Allies began the Berlin Airlift, which transported desperately needed food and fuel to the beleaguered city. Flying for almost a year, Allied aircraft kept the city supplied until the Soviets relented in May 1949. That same month, the Western-controlled sectors were formed into the Federal Republic of Germany (West Germany). This was countered by the Soviets that October ​when they reconstituted their sector into the German Democratic Republic (East Germany). This coincided with their increasing control over governments in Eastern Europe. Angered by the Western Allies' lack of action to prevent the Soviets from taking control, these nations referred to their abandonment as the "Western Betrayal." As the politics of postwar Europe were taking shape, efforts were made to rebuild the continent's shattered economy. In an attempt to expedite economic regrowth and ensure the survival of democratic governments, the United States allocated $13 billion to the rebuilding of Western Europe. Beginning in 1947, and known as the European Recovery Program (Marshall Plan), the program ran until 1952. In both Germany and Japan, efforts were made to locate and prosecute war criminals. In Germany, the accused were tried at Nuremberg while in Japan the trials were held in Tokyo. As tensions rose and the Cold War began, the issue of Germany remained unresolved. Though two nations had been created from pre-war Germany, Berlin technically remained occupied and no final settlement had been concluded. For the next 45 years, Germany was on the front lines of the Cold War. It was only with the fall of the Berlin Wall in 1989, and the collapse of Soviet control in Eastern Europe that the final issues of the war could be resolved. In 1990, the Treaty on the Final Settlement With Respect to Germany was signed, reunifying Germany and officially ending World War II in Europe.